In case of metal structures exposed to atmospheric corrosion the films resistant to such environment are required. Increasing are the demands regarding material resistant to the environment containing salts and moisture, aggressive gases and liquids. Therefore for this purpose the corrosion tests were realized according to STN 03 8143 standard in the mist of acidified solution of sodium chloride. 1 pc—Ø 163 piston with the plasma spray coating with the thickness of 0.3–0.6 mm. The samples were exposed to the effects of mist of 5 % NaCl solution acidified by acetic acid to pH of 3.0–3.1 at the temperature of 35 ± 2 °C in a mist chamber. The piston with plasma spray coating was conserved to the half by preservative oil OK 5 and the other half was degreased by technical petrol. After 48 h in case of the chromium plated film the corrosion occurred on the steel basic material in the extend of 10 spots with the size of 1 mm2. Corrosion of the sprayed material appeared after 96 h in the degreased part of the piston whereas the chromium plated film was already heavily corroded. 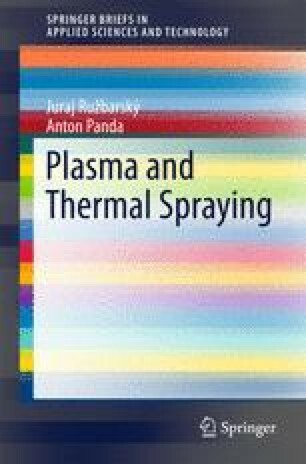 The thickness of plasma spray coating is uneven from 0.3 up to 0.6 mm which can impact the unevenness of the corroded surface. As the basic material remained intact and disturbance affected just the plasma spray coating, the spray coating can be ground off by using the old basic material.